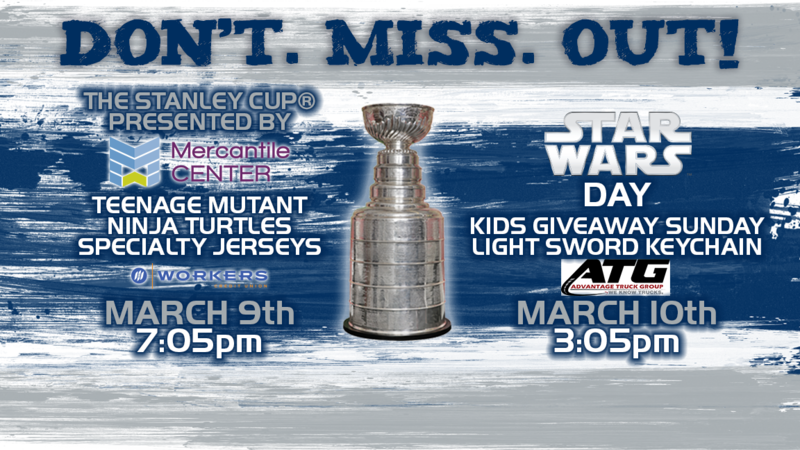 Worcester, MA– The Worcester Railers Hockey Club (@RailersHC), proud ECHL (@ECHL) affiliate of the New York Islanders® (@NYIslanders), announced today that the Stanley Cup® will appear at the Worcester Railers game at the DCU Center on March 9 at 7pm presented by Mercantile Center and that the club will host STAR WARS DAY on Sunday, March 10 at 3pm. On Saturday, March 9 the Railers host the Norfolk Admirals at 7pm on a BIG GAME SATURDAY! The Stanley Cup® will appear from 6-8:30pm in the DCU Center concourse presented by Mercantile Center. Fans will have an opportunity to take their photo with the Stanley Cup®during the game. The Railers will be a wearing a special Teenage Mutant Ninja Turtles jersey on Nickelodeon Night presented by the Workers Credit Union. Every Saturday night home game is SATURDAY NIGHT SIGNINGS presented by MidState Auto Group with a Railers player signing autographs during the first intermission. In addition, the Stanley Cup® will appear at the 1st Annual Worcester WinterFest at Mercantile Center. WinterFest will take place Saturday, March 9 from 12:00pm – 6:00pm and will feature Ice Sculptures (one of the Stanley Cup®), Live Music, Children’s Games, Food Trucks, A Beer Garden and more! Special feature is the Stanley Cup® from 4:30pm-5:15pm. The event is free and open to the public and is located at 100 Front Street in Worcester next to the Mercantile Center Garage, 201 Commercial Street. On Sunday, March 10 the Railers host the South Carolina Stingrays at 3pm on STAR WARS DAY on a KIDS GIVEAWAY SUNDAY! Meet Star Wars characters and the first 1,000 kids 12-and-under will receive a light sword keychain courtesy of Advantage Truck Group! Score a SUNDAY FUNDAY ticket pack every Sunday which includes 4 ticket and 4 beers or 4 tickets and 4 sodas/popcorns starting at just $60! Individual tickets to the Railers game start as low as $15 by calling 508-365-1750 or visit RailersHC.com. Save $$$ with a RAILERS 6 PACK which includes six flex tickets and a Railers winter hat starting at $99. The Railers Tavernlocated behind the DCU Center provides hockey fans with a great pregame and postgame atmosphere all season long. Watch all road games broadcast live at Nonna’s (FRI, SAT, SUN) or Railers Tavern (MON-THU) or watch on ECHLTV.com for a small fee. Listen to all Railers games live on 98.9 Nash ICONwith coverage beginning 30 minutes before puck drop with Eric Lindquist and Tom Matthews. Full season memberships, mini plans, and group tickets are on sale now by calling the Railers front office at 508-365-1750or by visiting www.RailersHC.com. For information on the 1stAnnual Worcester WinterFest, please call617-439-7700. Worcester Railers Hockey….Don’t. Miss. Out!